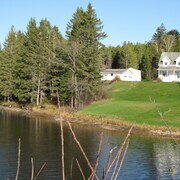 Enjoy Rural New Brunswick at Blue Cottage! This vacation home is situated on a lake. Family Waterfront Property- Clarks Getaway! Well kept cute little spot. Wonderful hosts who made sure everything was perfect....and it was. Grandkids loved the sauna and plunging in the snow between steams....satellite tv made boys evening watching World junior gold medal game....kitchen had everything we needed and more! Comfortably accommodated us and our son and daughter in-law on Saturday night....along with our grandkids. Overall just a great stay. Thanks Cara and Wayne! A verified traveller stayed at Enjoy Rural New Brunswick at Blue Cottage! Where to find Nackawic hotels near an airport? Where can I find hotels in Nackawic that are near tourist attractions? Expedia's extensive Canada accommodation database doesn't list any places to stay in the vicinity of Nackawic. However, Sackville has a number of hotel and apartment options. It is 220 kilometres (138 miles) from Nackawic. 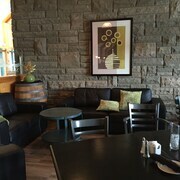 Expedia approved accommodation options in Sackville are the Coastal Inn Sackville and Marshlands Inn. 45 kilometres (29 miles) away from Nackawic you will find Fredericton, where you can spend the day visiting University of New Brunswick and Regent Mall. The Delta Hotels by Marriott Fredericton and Crowne Plaza Fredericton-Lord Beaverbrook are some of the Expedia-recommended short and long-stay options in Fredericton. Or stay in Woodstock, 35 kilometres (21 miles) to the northwest of Nackawic, where you can pick from the Best Western Plus Woodstock Hotel & Conference Centre and Knights Inn Woodstock. The Carleton Civic Centre and Carleton County Historical Society are just some of the more popular points of interest to experience while in Woodstock. If you enjoy sports and love watching games you might choose to head to Chapman Field, which is 45 kilometres (29 miles) to the east of Nackawic. 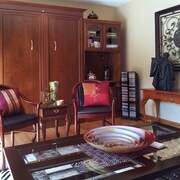 Book accommodation close to the action at the Best Western Plus Fredericton Hotel & Suites or the Comfort Inn. Thank you for taking the time to explore our Nackawic accommodations. Be sure to spend a little time exploring our Nackawic travel guide for great information on this place's scenic and cultural delights. Are there hotels in other cities near Nackawic? What other types of accommodations are available in Nackawic? Explore Nackawic with Expedia.ca’s Travel Guides to find the best flights, cars, holiday packages and more!